It’s a stellar suggestion along the same lines as Bill Hogan’s overused elephant eaten one bite at a time. As a writer, it educates us to keep writing in order to produce and as a life lesson it reminds us that we can endure by moving forward step by step. In fact, the world famous productivity consultant, David Allen suggests that we organize our lives by keeping a list of the single next actionable steps we must take in order to accomplish our goals. Big audacious dreams can be intimidating and also set us up for disappointment but broken into single-action steps, they’re more reasonable and it’s much easier to correct if we get off track. My single next action? Open the fridge. Count the heads of lettuce. Seven! It’s in season and abundant and while I enjoy a green salad, I can’t consume them in the quantity it will take to use this up. So I’ll heed to the advice of Anne Lamott’s dad, Bill Hogan and David Allen and start with a single head. 1. 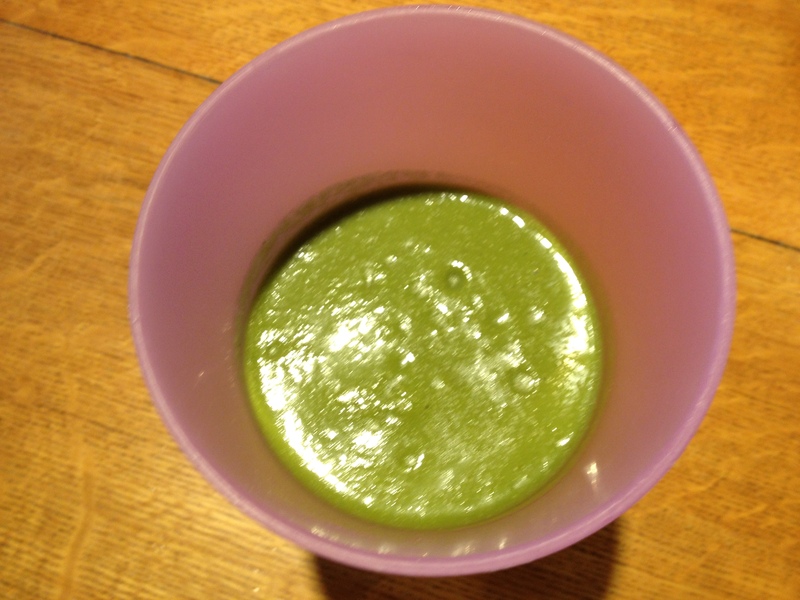 Lettuce juice – My juicer is my go to gadget when I need to use something up fast. 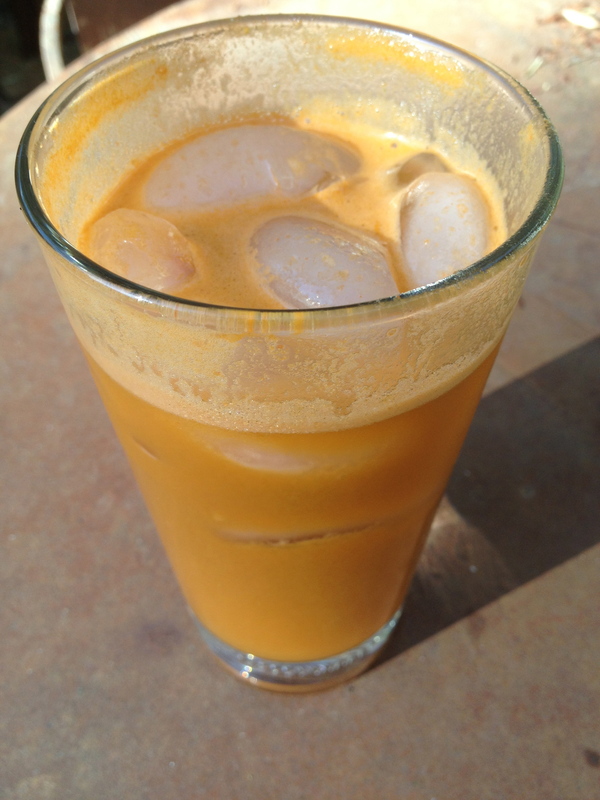 Throw in a head of lettuce, a few oranges and a carrot or two and presto, I have a lovely healthy morning beverage. 2. 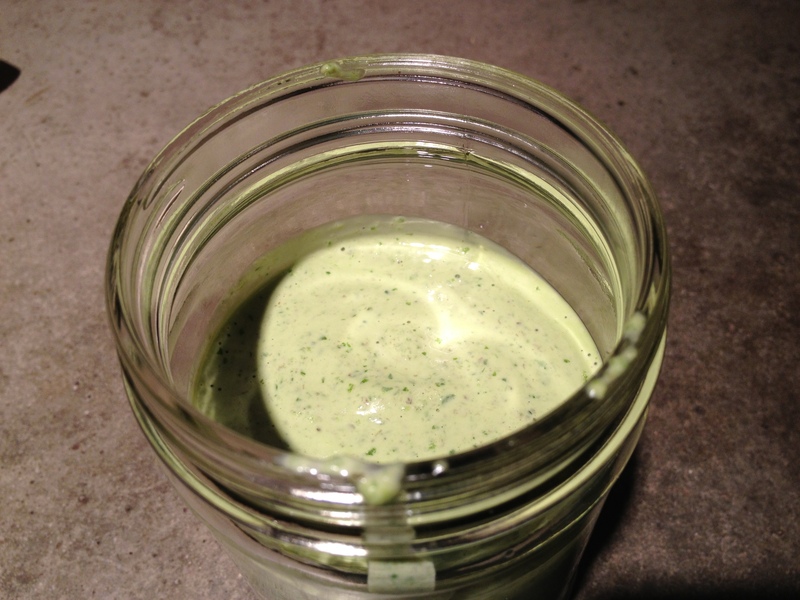 Lettuce sauce – Whip up this Emeril special to accompany eggs, fish or in our case, roasted vegetables. There’s no ingredient inside this recipe that I don’t enjoy. 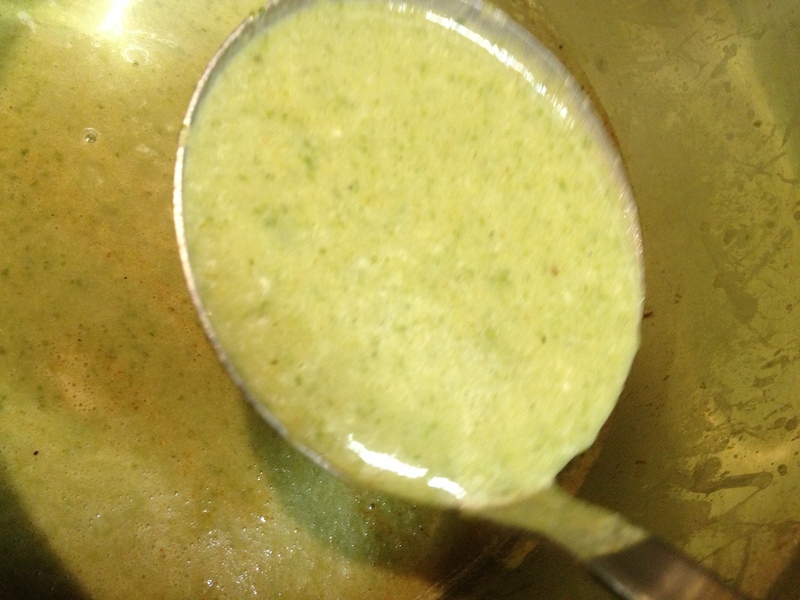 In a food processor: a head of lettuce, an egg yolk, 2 tsp capers, juice of 1 lemon, 2 Tbs. fresh parsley, 2 Tbs red onion, 1 clove garlic, 1/2 tsp dijon, basil to taste, 1/2 cup good olive oil, salt and pepper. Slather it on. 3. 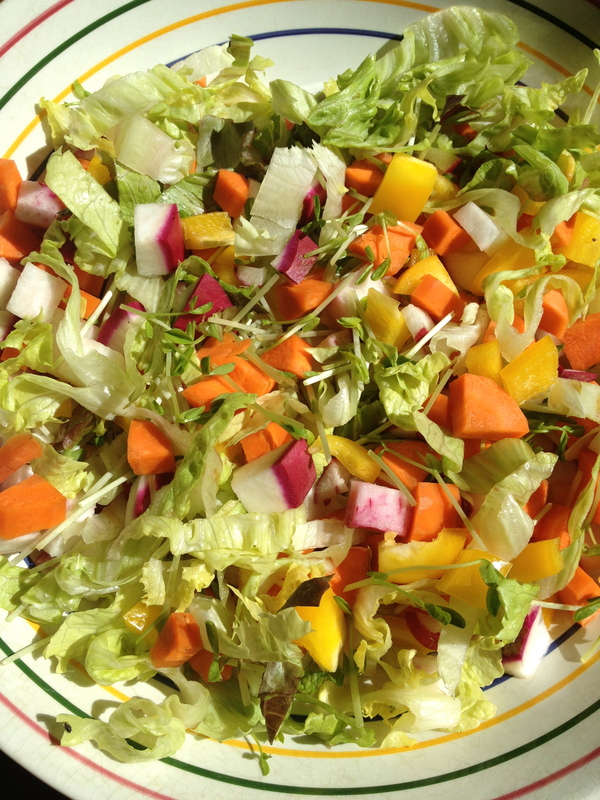 Lettuce salad – We enjoy dense chopped salads that can be eaten as a meal. Frankly, they’re worthy of a post on their own but lettuce can is a key component. 4. Lettuce soup – was a five thumbs up hit with no two hands on any one body. Easy, delicious, not thought of. Try it. 5. Lettuce wraps – Use lettuce like a taco shell or a tortilla. My husband and kids fill them with seasoned ground beef (locally raised), tomatoes and cheese. I love to slather it with some of Ani Phyo’s Ginger Almond Paté. I won’t give you the recipe though – you’ll have to buy her book! 6. 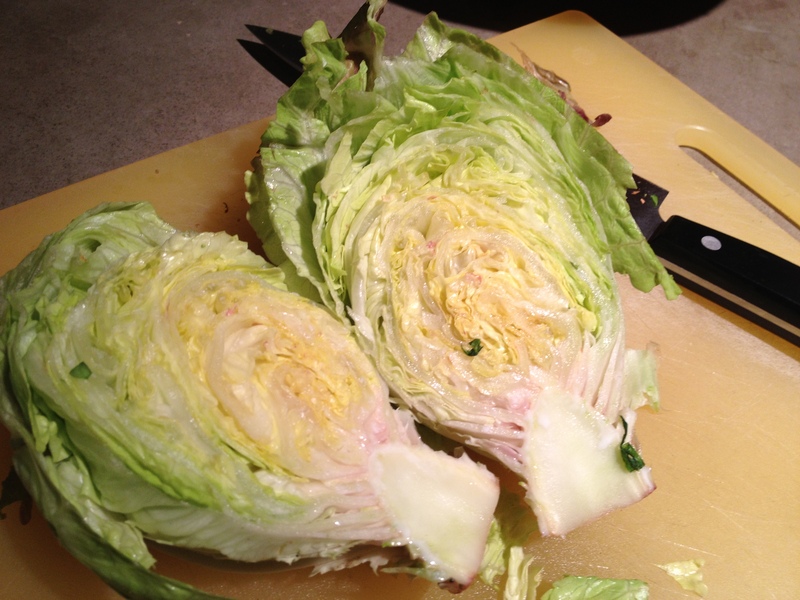 Lettuce grilled – I didn’t feel like going outdoors and so did these on the griddle but they worked very well. I served them with crumbled blue cheese, balsamic and cherry tomatoes halved. 7. Lettuce Smoothie – Efficient, easy, full of goodness. Throw a couple of cups of lettuce into your high-speed blender with other morning treats like a frozen banana and some berries. If it’s too bitter, add a couple of drops of stevia. What’s in front of you that needs to be dealt with one step at a time? I’m with Kellyann, feeling a bit “green” about your fresh lettuce, which is still a pipedream in my part of the world. And I LOVE “Bird By Bird” – I use it in every writing class I teach, and it inspires me on a regular basis. I might have to reread it this weekend – thanks for the inspiration! Maybe I’ll reread it to. It is such an inspiration. Yum… And great advice on writing and other endeavors! I was honestly surprised at things like lettuce sauce and lettuce soup but they were both delicious. Ooooh, I feel another post coming on! I’ve bookmarked this, as we will be a household of 3 for the CSA season and I still plan to get a large share. I know I can put up so much of what I’ll be getting, but the salad greens were the one thing I was worried about. Yes, I have the composting pigs that will wheek for food, but in the spring our farmers do an amazing job of growing greens and while I’m happy to give the remnant of last week’s wilted greens to the pigs when the new box comes in the house, I’d prefer to eat them as much as I can. Especially that sauce–that so speaks to me now. The sauce is terrific and takes 2 minutes to make. I know what you mean – I can always compost but if we can eat them, that’s my preference. Those are some great suggestions for how to use up lettuce. That morning drink is right up my alley. Thank you! Estrella, the sauce is right up your alley also. I remember making mayo from your blog and also an eggplant dish that was much like this. Bird by Bird is one of the all-time great writing books. I discovered it in the mid-90s when I had dreams of making a living as a writer. Haven’t given up on that, so Bird by Bird is still on my bookshelf! And, of course, I love all things green so lettuce everything sounds wonderful to me. It sounds like the book is a favorite of everyone! I’m surprised although I shouldn’t be. Lettuce grilled…hum, I have GOT to try that! It’s so easy and really does offer a different “salad” option. Every one of these recipes makes me long for “greens season” here in northern Michigan. It’s still a bit far into the future for us here! 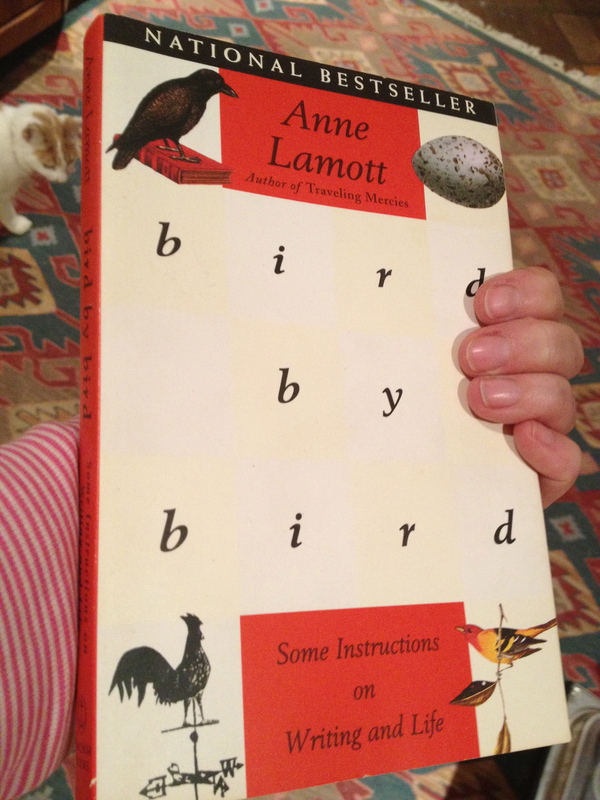 I love Bird by Bird…I think one of the best ever down-to-earth books on writing. Thanks, Tammy! Yes, greens are off your menu for a while. We really are having a great season of them here. Charlie, I think you’d really like the lettuce sauce and of course, you could make it with other things but it really suits grilled items. Lettuce soup sounds good. Today is baking day, one recipe at a time. I didn’t expect it to be as well accepted as it was. It’s very very good. I made it with 2% milk instead of cream to lighten it up. I knew a few ways to use up lettuce! I also love to use it in soups & I loveit grilled too! thanks for the other tasty alternatives! Grilled is new to me Sophie but I do like it that way. Elevating the lettuce we too often take for granted, yay! I love them grilled and braised. I love Bird by Bird too. Nice post! I only tried it for the first time recently and I like it. Not all the time but it’s a really nice alternative. And all the great ideas with lettuce .. .thank you! I have been eating more salads, but sometimes still can’t use it all that way. I had forgotten how much I enjoyed lettuce as a wrap! You reminded me! You’ll like the book Deb. Anne Lamott is a Christian writer who came into her faith the hard way – like some of us do. I love Bird by Bird — such an enduring classic. I think every writer should have a copy! Thanks for all the lettuce ideas. I am not much of a salad person, so I’m always stymied by lettuce. Then these are great recipes for you. I was surprised at how well the sauce and the soup worked. I would never have thought of drinking a head of lettuce. I would maybe try it to be able to freeze it, as freezing lettuce in the solid form, as you probably know just doesn’t work. No, that just doesn’t work. You can however, saute it and then freeze it. Bird by bird. A sage piece of advice, and I think a recipe for happiness. And I would never have thought of using lettuce in so many different ways! Thanks, Tammy…I just need to run this post off and keep it on my fridge…. These recipes are all so simple too Kate. Perfect for tackling things one step at a time. I had never heard of this book “Bird by Bird”, sounds very interesting. I like the idea of writing lists to better approach an intimidating goal. As for the lettuces… not yet in Season but I will remember your delicious suggestions. Thanks Tammy. Isa, I think you would love this book. Anne Lamott is very real and this book she reveals much about herself. And so are you Vaastuschool! Love you brother. You know what? I can actually eat lettuce just like that. I am marking all your lettuce recipes specially the sauce. That and dukka spice fried chicken. YUMZO. It would probably be really good with a fried chicken – I can’t go there. Love lettuce wrap. Now I’m not sure about lettuce smoothie. It does looks healthy. I’m mizzing Kale , spinach and carrots with fruits and I really enjoy the taste as well as the health benifits. You would enjoy the lettuce smoothie. It just matters what you put with it. the writing group sounds great. I need a critique group, how did you go about finding a good one? You can email me it is a longer story (thelettuceedge @ gmail .com). I loved Bird by Bird. I found one at my local community college but you might also try Shewrites or meet up. I never thought of grilling lettuce! I will have to give that a try. You always inspire me to try new things…Thanks! Use a hearty romaine for grilling and then use it as the basis for a caesar – yum. Hi Tammy, for me right now it’s Recipe by Recipe. I’ve had delicious grilled caesar salad—the romaine is sturdy enough to withstand the char. And, I’ve had lettuce in soups. I have yet to drink it! I cannot believe how popular the lettuce soup was at our table. Loved the whole post. It was fun to read about meeting up with your writing group with Bird by Bird in hand. I’ll have to remember that idea. Lettuce soup? I never dreamed. Lettuce in my smoothie or juicer? Why did I never think of that? I just bought spinach today for those purposes, but not resourceful enough to think of lettuce. Thanks for all the tips, Tammy. I prefer spinach in a smoothie but if you have 7 heads of lettuce to deal with, it is a fine substitute. A superb post! Love the “one bite at a time” approach, a lesson I need to remind myself of. And som egreat suggestions there, haven’t tried lettuce sauce before, so will have to check that one out. I make an Endive letuce and bean soup that is light and summery. Yum! I love the sound of endive and bean soup! It’s snowing again here–I wish I had 7 heads of lettuce in my fridge! I just cooked up the last of fall’s cabbage pretty much one head at a time however! These are great ideas–lettuce can be a challenge since it doesn’t keep for months or freeze. Grilled lettuce sounds positively gourmet! I am on to cabbage now. Suggestions? It freezes beautifully so I put 3 old cabbages into this and froze the leftovers in smaller portions. This is one of my favorite books! What a fun group of writers you have. And great suggestions for cooking with lettuce! Creativity is one of the reasons that CSAs are so much fun! Step by step is *the* strategy for me! I used to make the mistake that I planned to do something but missed to account for the steps of implementation. And you know I’m currently working on getting myself right again, which won’t work if I don’t take it stepwise. Great idea Kath and so glad to hear you are on the mend! This post particularly important to me right now. I am reading at the exact right time to implement your ideas! Thank you. And the sauce and soup sound lovely. I am on a three day juice fast, and lettuce part of the ingredients. Great ideas and tools. Hi Tammy, thank you so much for visiting my blog. I am so glad to have found your wonderful blog and am looking forward to reading more. I live on two acres in the Sonoran Desert and am in the research and planning stage for starting a garden. We have citrus and fruit trees, herbs and tomatoes and are so excited to have a full garden. Thank you for the great ideas! We are very lucky to be able to plant year-round here. I could totally have used this mid-summer….I had so many damned cos lettuces that many of them turned into cos trees and got fed to the worms. They were pretty happy with that outcome though! Worms need to eat too and truly, that isn’t a terrible outcome.